You are probably reading this because you have decided it is time to quit smoking. Good for you. You have taken that first critical step to a healthier life. Or you might be reading this because you are tired of watching a loved one puff away his life and lungs one expensive stick at a time. Good for you too. You are saving him from strokes, heart attacks and all sorts of nasty diseases. We all know the harmful health effects of smoking. Most of us also know of the similar harmful effects of second hand smoke. Not that you need another reason to quit smoking but have you heard of third hand smoke? This is the residual smoke that remains on indoor surfaces even after the cigarette has been extinguished. So even if you do not smoke in front of your children, the residual smoke in the sofa or carpet can still be affecting their health. 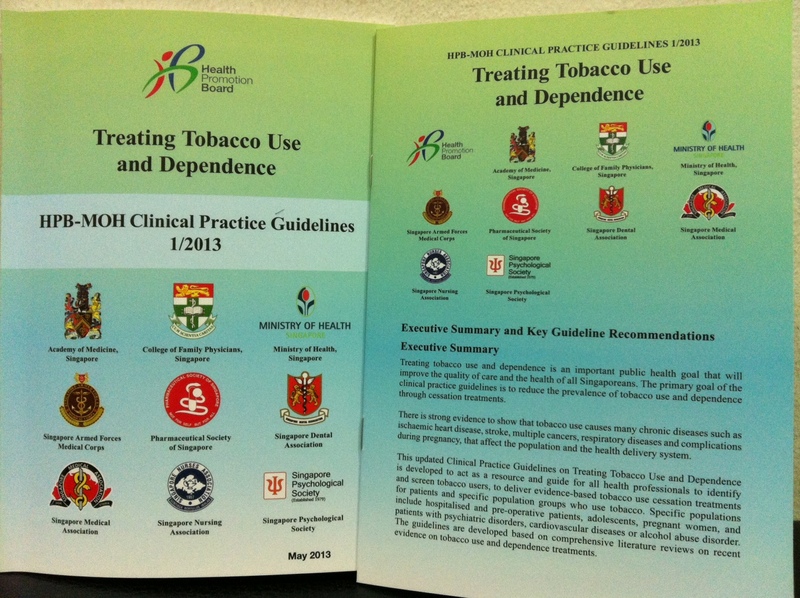 Recently, Singapore’s Health Promotion Board and Ministry of Health published its Clinical Practice Guidelines on Treating Tobacco Use and Dependence. Let’s see what wisdom we can glean from this booklet. Apparently something called person to person behavioural support. That’s right. If you keep telling a person not to smoke, be it as an individual, in a group or even through the telephone, the more likely he will not smoke. Who knew? In fact, there is strong evidence to show that the longer the session and the more counselling sessions a person attends, the more likely he will stop smoking. Here are the numbers: 24.7% of people will quit smoking with 8 sessions compared to 16.3% with 2 to 3 sessions. 22.1% of people will quit smoking if each session lasts more than 10 minutes as opposed to 13.4% if each session lasts less than 3 minutes. What was more interesting from the above data is that it also applies to counselling via telephone. In fact, even pre-recorded messages seem to work just as well as talking to another human being. So it is not too surprising that web based interventions including social media, text messages and phones apps all have been shown to increase smoking cessation rates. A quick search with the terms ‘Quit Smoking’ on the App Store resulted in 300 Apps to quit smoking! I cannot say I know which ones work best but I think it boils down to the one that you like and that you will stick with. Which works better: Cold Turkey or Gradual Reduction? Apparently, no difference, at least that is what the statistics show. Medicines work. No surprise there either. Nicotine Replacement treatments be it in the form of patches, gums, lozenges or inhalers all have been shown to improve rates of smoking cessation. Commonly reported side effects are insomnia, abnormal dreams (I personally do not know what a ‘normal dream’ is), headache, nausea, dizziness and palpitations. An interesting finding was a technique called NARS which stands for Nicotine Assisted Reduction to Stop. Smokers who have not decided to quit should be encouraged to take some form of Nicotine replacement to reduce the number of cigarettes smoked per day. This actually results in twice the number of people quitting smoking after 6 months. Varenicline (marketed as Champix in Singapore) is an oral tablet used to help a patient stop smoking. Patients on Varenicline are 3 times as likely to stop smoking compared to a placebo. Common side effects include insomnia, headache, abnormal dreams and nausea. So what does not work? According to the HPB document, both acupuncture and hypnotherapy do not work. I have nothing against acupuncturist and hypnotherapists however, this is classed as Grade A recommendation, Level 1 ++ evidence! This is about as rock solid as you can get in terms of medical proof. Another thing that has not been found to work is E-cigarettes. However, this is a Grade C recommendation with Level 3 evidence. So there have only been case reports and no analytical studies. In other words some doctors say that it does not work in their patients but we don’t really know for sure. This is a telephone counselling hotline run by the Health Promotion Board to help people quit smoking. This website targets youth smokers and helps them quit smoking. 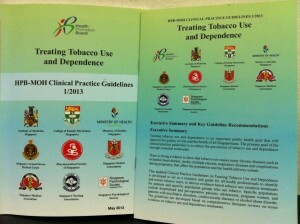 All hospital, polyclinics and pharmacies (yes including Guardian and Watson’s) have services to help you quit smoking. Look up their individual web pages for contact information. Or you can speak to your friendly neighbourhood GP. Would you please inform me, where to buy Champix Varenicline in Singapore. I’m from Indonesia, and I’m planning to go to Singapore if there is a drug store there selling the medicine. Champix is a prescription medicines in Singapore. You have to first visit a doctor to get a prescription before you can buy it from a drug store. Some clinics carry Champix so you can purchase from the clinics directly after seeing the doctor. Can you recommend any resources to acquire some decent pamphlets that I can use to hand out to my patients who I am trying to push from the pre-contemplation to comtemplation phase? I am currently working with NHGP and am trying to do a QI project on improving the smoking cessation referral rates to our pharmacy as it is currently severely underutilised. Do let me know if you have any information on this! Hello Dr Arvin. The best resource I know of is the “I Quit” program by HPB. They provide clinics like ours with free brochures. I’m sure they will be happy to provide you with some.